Weight net. 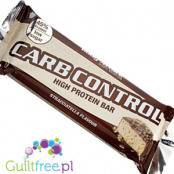 62g. 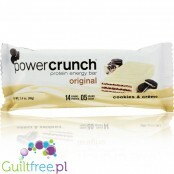 ; 14,39 pln/100g. 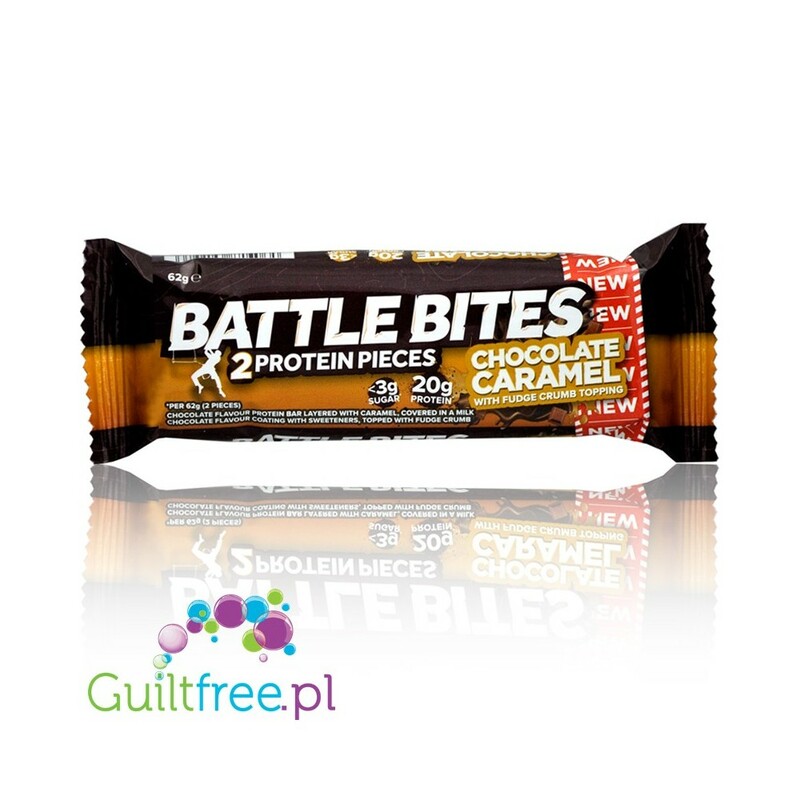 Ingredients: Protein Blend (22%)(Milk Protein Concentrate (Milk), Calcium Caseinate (Milk), Whey Protein Concentrate (Milk)), Caramel (13%)(Chicory Root Fibre, Humectant (Vegetable Glycerol), Palm Kernal, Water, Butter (Milk), Sustainable Palm Oil, Emulsifiers (Mono- and diglycerides of fatty acids, Sorbitan Tri-Stearate, Rapeseed Lecithin), Gelling Agent (Pectin), Salt)), Humectant (Vegetable Glycerol), Chicory Root Fibre, Milk Chocolate Coating (10%)( Sweetners ( Isomalt, Sucralose), Sustainable Palm Oil, Cocoa Powder, Whey Powder (Milk), Flour (Wheat Flour, Calcium Carbonate, Iron, Niacin, Thiamine), Emulsifier (Soya Lecithin), Natural Flavourings)Soy Protein Nuggets (10%)(Isolated Soy Protein, Cocoa Powder, Tapioca Starch), Corn Fibre, Rapeseed Oil, Hydrolysed Collagen, Cocoa Powder (2%), Fudge Crumb (2%)(Sugar, Sweetened Condensed Milk (Milk, Sugar), Fondant (Sugar, Glucose Syrup, Water), Glucose Syrup, Sustainable Palm Oil, Golden Syrup, Butter Oil (Milk), Natural Flavour, Humectant (Vegetable Glycerol)), Natural Flavouring, Emulsifier (Sunflower Lecithin), Oat Flour, Thickener (Acacia Gum), Sea Salt, Colour (Plain Caramel), Sucralose. 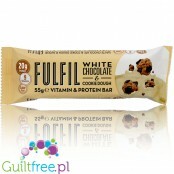 Allergens: contains milk, soy, gluten. 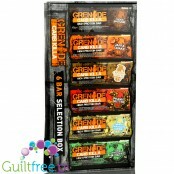 May contain nuts, eggs. Storage: store in a cool dry place in a tightly closed container, protect from light. 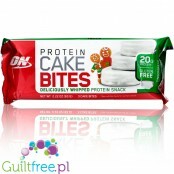 The latest deliciousness in the protein family Quest - a delicate, soft cinnamon cake is almost sugar-free and contains up to 15g of protein and 12g of fiber. 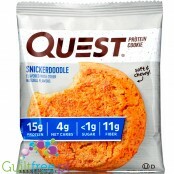 Gluten-free Quest protein cookies are sweetened only with stevia and erytrol - they do not contain sucralose, maltitol or added sugar. 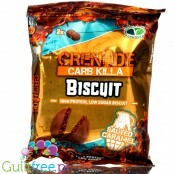 Just like Grenade’s many other Carb Killa products, the new Carb Killa Biscuit is a delicious high protein, low sugar snack. 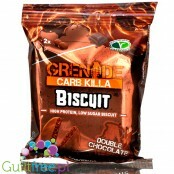 It is a great, healthy alternative for biscuit lovers with each packet of the Carb Killa Biscuit coming with two delicious, chocolate coated treats. 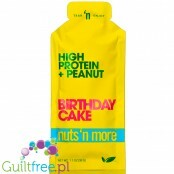 Sweetened xylitol Birthday Cake peanut butter, cream, aromatic peanuts with the highest quality Whey Protein (WPC) - one serving contains up to 12g of wholesome protein! 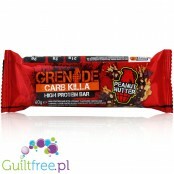 Unique Nuts' N More Nut Butter is a delicious, healthy and valuable addition to the diet of hard-working and sedentary people. 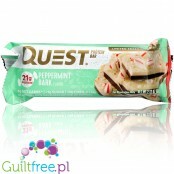 An exceptionally delicious, soft protein bar with a unique flavor of legendary cookies with cream. 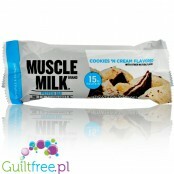 15g of protein from sources with varied etching kinetics perfectly feeds on hunger and works as a pre-or post-workout snack. 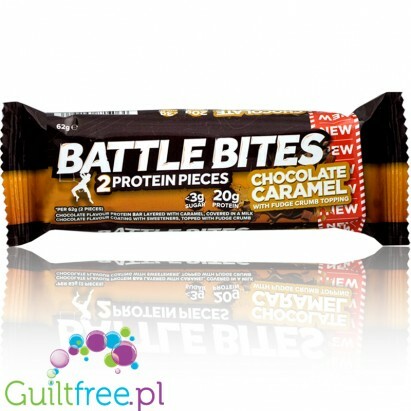 Crispy, not overly sweet, with strong chocolate & peanut taste and it really tastes like Reese's peanut butter cups! You can smell a wisp of it when you open the package, but you can't taste the sweetener. Texture is that of rice krispie. 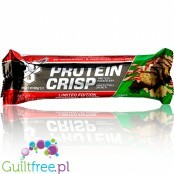 15g of protein and only 150kcal!